The Church’s liturgical calendar is based in a cycle of sacred stories that actually takes three years to complete, before the three-year cycle begins again. Each year within a three-year cycle includes regular seasons (such as the seasons of Epiphany, Lent, Easter, Pentecost, etc) and annual feast days. In our annual calendar, every liturgical year ends with the feast day of Christ the King, while the beginning of each yearly cycle begins with the season of Advent. Like the season of Lent, Advent is a time of preparation. However, while Lent prepares us for the death and resurrection of Christ, Advent prepares us for the birth of Jesus – the first chapter of the Christian expression of human relationship with God, with ancient roots deep within the development of human religious history. Like other seasons of the church year, Advent is a time informed by the rich traditions of our faith. One of the most beloved traditions of Advent practiced both in the home and in church services is the Advent wreath, also known as the Advent “crown.” An Advent wreath can either be a horizontal display of four candles, or a circular display of four candles with a fifth candle in the center. By whatever form it takes, an Advent wreath is calendar which (quite literally) highlights the sacred time passing during the four weeks leading up to Christmas. Beginning with the First Sunday of Advent, the lighting of a candle can be accompanied by Scripture readings and by personal prayers. An additional candle is lit during each subsequent week until, by the last Sunday before Christmas, all four candles are lit. Many Advent wreaths include a fifth and central candle, often referred to as the Christ candle, which is lit at Christmas Eve or on Christmas morning. As with many traditions, the origin of the Advent wreath is a matter of no small speculation and debate. However, the symbols which compose the Advent wreath are of great antiquity and come together to form an important lexicon of teachings about our faith. Firstly, the Advent wreath reminds of two types of waiting – waiting for Christ’s return after his ascension and the waiting for the celebration of Jesus’ birth (Christmas). In both types of waiting, the community is waiting for Christ – waiting for the fulfillment of the promises of God, which is the transformation of the world and of hearts so that peace and justice may be known by all peoples. And yet, the candles remind us that the Light of Christ is already in the world, that we follow the God who is Emmanuel – the “God with us” – and that we are called to be light to the world in the here and now. The Advent wreath, therefore, is as much about God waiting for us to become that light even as it is about us who yearn for God’s light in times of darkness. Both the People and God long for the Kingdom of Heaven on Earth. Secondly, the colors of the candles have meaning and communicate somewhat different ideas, depending on the color of the candles. Most Advent wreath traditions use three purple or blue candles and one pink candle. If there is a fifth central candle, that candle is usually white. Purple is the ancient Mediterranean color associated with royalty or nobility (and can be used to recognize Christ’s kingly nature), and purple is also the color in the church associated with penitence (as such, it is the liturgical color for the season of Lent). You may notice, however, that in the Episcopal Church, we have more commonly used blue as the liturgical color for Advent. Therefore, our Advent wreaths can tend to use three blue candles (rather than purple). For the church, the color blue signifies hope and waiting, and it is the color associated with Mary the Mother of God (who is especially honored during the season of Advent leading up to the birth of her Son). Additionally, the blue color has a particular history in the Anglican church (of which we are a part and which informs our specific identity as a faith tradition). Namely, the 1979 Book of Common Prayer lifts up the theme of expectation to the season of Advent and brings greater focus to the role of Mary, Mother of Jesus, in the Incarnation event. In keeping with this emphasis, the Sarum Rite (i.e., the traditions associated with Salisbury Cathedral, England) adopted the use of a dusty-blue color for Advent, rather than the violet which is associated with the season’s former penitential nature. The Sarum Rite, was a variant of the Roman Catholic liturgy practiced in Great Britain from the late 11th Century until the Protestant Reformation. In 1078, King William the Conqueror, or William I of England, appointed St. Osmund, a Norman nobleman, bishop of Sarum (Salisbury). As bishop, Osmund initiated some revisions to the Roman Rite, drawing on both Norman and Anglo-Saxon traditions, including the development of the Sarum Rite. Many of the accouterments and liturgical practices associated with the Sarum Rite were revived in the Anglican Communion in the late 19th and early 20th centuries (as part of the Anglo-Catholic Oxford Movement in the Church of England). Today, however, the Sarum Rite is remembered for its distinctive scheme of liturgical colors, which differs somewhat from that used in the Roman Catholic and most Protestant churches. In the Sarum Rite, blue rather than purple is authorized during Advent. The shade of blue used during Advent resembles royal blue, and is referred to as “Sarum blue.” So, long story short, using three blue candles is an especially Anglican/Episcopalian thing to do. The pink candle in the set of Advent wreath candles has an entire history of its own. In the earliest years of the church the only church season was Lent, the seven weeks prior to Easter. Lent was a season of fasting and prayer as the church commemorated the crucifixion of Jesus. The traditional color of banners in the church during this time, therefore, was a deep purple. During Lent the church lit seven candles, one for each week of the solemn season. However, though the season is solemn, the story of Lent also has a hint of hope and joy since the death of Christ prefigured the resurrection. The forth Sunday of Lent is called Laetare Sunday, “laetare” meaning “rejoice” in Latin. On Laetare Sunday, the church was encouraged not to fast, but to feast. In ancient times on Laetare Sunday the Pope would honor a citizen with a pink rose, and as time passed the priests wore pink vestments on this day as a reminder of the coming joy. 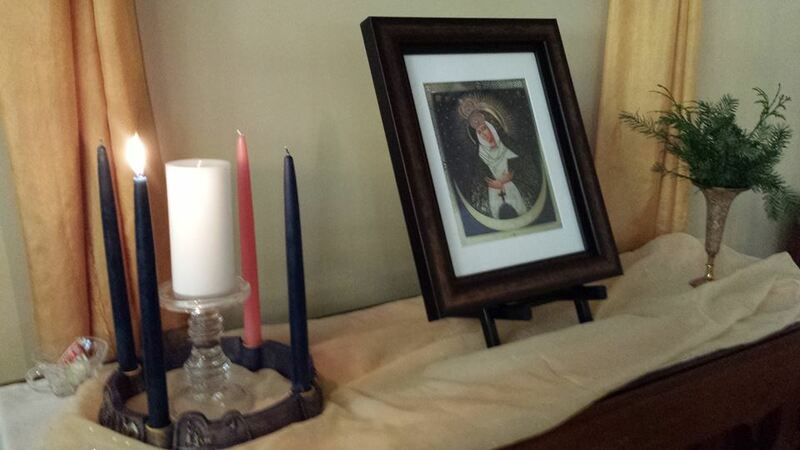 In current Episcopal practice of the Advent wreath, the pink candle is lit on the third week of Advent. The third Sunday of Advent is called Gaudete Sunday. “Gaudete” (like “laetare”) means Rejoice” in Latin, and is also known as a Rose Sunday. This custom is not required by the Episcopal Church, but it is observed by some parishes with a traditional Anglo-Catholic piety, such as Trinity is known to practice in our liturgies. In Therefore, in Anglo-Catholic practice, it is common for clergy to wear pink vestments twice a year – on Laetare Sunday in Lent and on Gaudete Sunday in Advent. Pink is the color associated with anticipatory joy, being somewhere between the dark purple or blue associated with challenging times (associated with Lent and Advent) and the white of festal celebration (used at Easter and Christmas). Another symbol informing the Advent wreath is the wealth itself. The ring or wheel of the Advent wreath of evergreens symbolizes the love of God which has no beginning and no end (a circle) while the evergreens and lighted candles signify the persistence of greening life and light, even in the midst of winter. The ring of candles also hearkens back to an ancient Celtic use of the solar disc which represents the Divine Light, which is why Celtic Christian crosses include a disc (or circular nimbus) shape. The first (blue) candle lit is the candle of Hope (and prophesy). The first candle symbolizes the promises the prophets delivered as messages from God; promises that foretold Christ’s birth. As followers of Christ, we are to engage the practice hope – for our own lives as well as bringing hope to others in times of difficulty, challenge or sorrow. Our ultimate hope is in Christ. The second (blue) candle to be lit is the candle of Love. The second candle reminds us that God loves the Creation God has made, including the creation he has made that is our unique selves. What we do to the least of our brethren (and we are related to all Creation), we do to Christ. The greatest commandment is that we love one another as Christ loved us. The third (pink/rose) candle to be lit is the candle of Joy. The third candle asks us to celebrate life. In the midst of harsh circumstances, Mary was joyful in fulfilling what God asked of her life and in having a child. We are asked to not give into despair but celebrate joy whenever we experience in ourselves or in the world around us. The forth (blue) candle is the candle of Peace. The fourth candle reminds that Jesus brings a kind of Peace to both the world and to people’s hearts which is not simply the absence of strife but a true and deep acceptance of all difference, such that no difference is a stumbling block to peace between peoples. As followers of Christ, we are to be the experience of peace for one another. The Central (white) Candle is the Christ Candle or Christmas candle. The fifth candle represents Christ who was born into a human experience so that humans might experience the Divine in this life as well as the next – that we might recognize Emmanuel (the God With Us) who is at once coming and already here, in us and in the world. This candle reminds the Baptized of the candle gifted to them at the time of their Baptism and as an echo of the Pascal candle which enters the church during the service of the Easter Vigil. We are to be light to the world. The light of God is born to us even as we are born anew by that light. In the dark of winter nights in the northern hemisphere, the promise of Christmas comes upon us quietly, reverently and certainly. There is no pomp and circumstance. There is only a family loving one another in the world that God has made. And by the light of Divine love experienced on Earth and through mortal life, the whole world can and will be transformed. The Kingdom of Heaven is in each heart, yearning to be born as light to the world. May the Blessings of this Holy Advent enlighten you with the fire and love of God, that you may bear Christ into the world which longs to know God face to face.